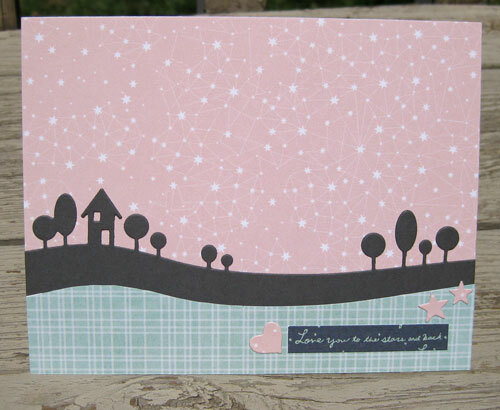 Here's the second card I made using the pink constellation paper from my Planetarium Studio Calico Kit. The pink paper made me think of a night sky so I cut out the tree/house silhouette out of dark grey paper to simulate night time. 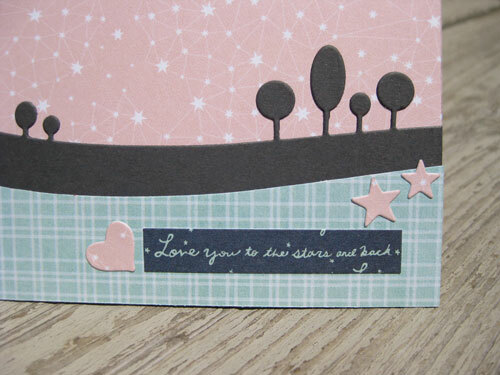 I used one of the other papers from the kit and cut out "Love you to the stars and back" to use as my sentiment. Below, I also tried another version, but I just don't like it. Something isn't right.... Maybe I should have reversed the two sky papers, I'm not sure. 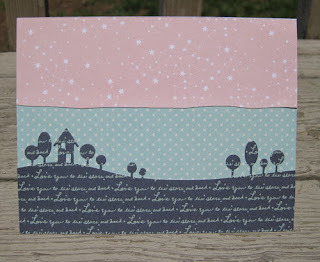 Paper: Dark blue w/ script and pink paper from Studio Calico Planetarium Kit. Aqua with stars (last card) from kit as well. The aqua with offbeat grid is from my stash. Probably from Jo-Anns or Michael's loose paper.